Readable is translated to English, German, Spanish, French, Dutch, Russian and Slovenian by default. This means you won’t need to translate the front-end strings manually, we found professional translators for these languages and took care for that already. All you have to do is to install the localized version of the WordPress in your language and the front-end will be translated already! Readable is made for best reading experience possible. We put a lot of effort in font size, hierarchy, weight, character per line, baseline grid, contrasts and colors, so it might happen that your eyes couldn’t stop reading at all. 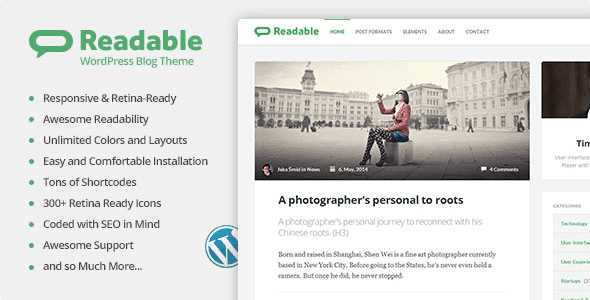 Item Reviewed: Readable WordPress Theme Focused on Readability 9 out of 10 based on 10 ratings. 9 user reviews.